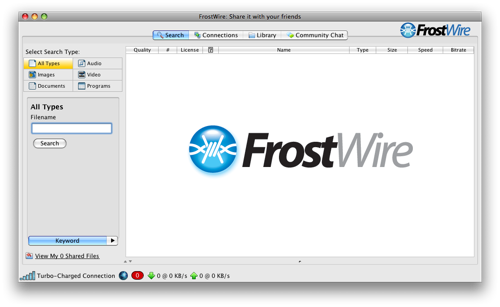 For those of you who use Gnutella file sharing networks, you may be interested in this slick clone of LimeWire which I myself only just discovered called FrostWire. Their website is painfully Web 2.0, but the app itself looks compelling. The problem with LimeWire is it intentionally connects to fewer peers and results lower download speeds unless you purchase the professional version. FrostWire doesn't have this limitation, and it's completely free (as in beer and speech) and contains no spyware or other nasties. As far as I can tell so far it uses the older LimeWire interface which I preferred anyway, and it's available for Windows, Mac OS X and a slew of Linux distributions. I don't use Gnutella anymore myself, but passing it on for what it may be worth. I'm not Bill Kurtis. Newer post ← The world is my coffee today folks!